Alex Jimbo Viteri was raised into a musical family. His first public presentation was at the age of four, and the first as soloist was at the age of five with the Antonio Vivaldi Children’s Orchestra. At the age of six he was presented as soloist with the Guayaquil Symphony Orchestra. After many successes in competitions, at the age of ten he won the Competition “Young Ecuadorian Soloists” and performed the Accolay Violin Concerto with the National Symphony Orchestra of Ecuador. 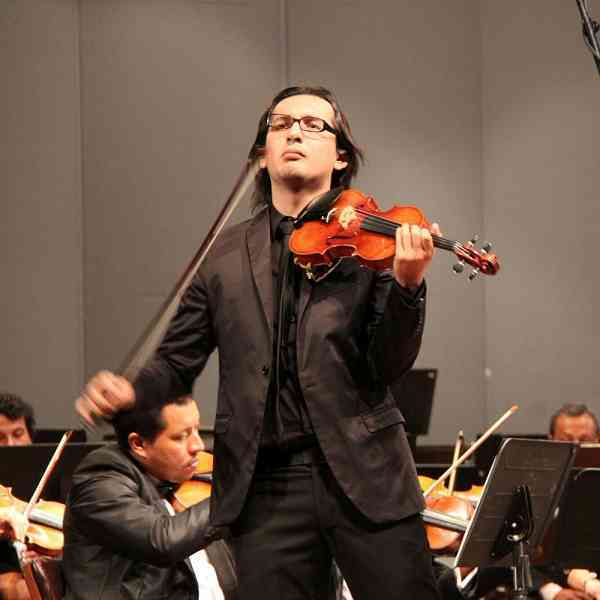 The following year he won an equivalent competition with the Guayaquil Symphony Orchestra. When he was twelve years old he won the Ninth National Competition for Young Soloist in Ecuador and performed the Mendelssohn Violin Concerto.Op.64 with the National Symphony Orchestra of Ecuador. Alex was the youngest member of the Ecuador Youth Symphony Orchestra and one of its founders. His performances have been broadcast on radio and TV. He was invited to participate in the master classes of famous violinist Shlomo Mintz in Israel. In the 2006 he was selected by Shlomo Mintz to perform with him the Bach:Concerto for Two Violins in D Minor, BWV 1043 with the National Symphony Orchestra of Ecuador. Alex Jimbo-Viteri is considered a talented young violinist, and as such has been invited to give several prestigious recitals. He took part of the famous Verbier Festival as a member of the Verbier Festival Academy and UBS Verbier Festival Orchestra working with the most prestigious soloist and conductors such as Manfred Honeck, Zubin Mehta, Sir Andrew Davis, Anne-Sophie Mutter, Esa-Pekka Salonen, Evgeny Kissin, Mischa Maisky, Joshua Bell, Leonidas Kavakos, Hillary Hahn, Lang Lang, Maxim Vengerov. Also, with the VFO, he was in concert tour through USA and Europe with Martha Argerich and Charles Dutoit.